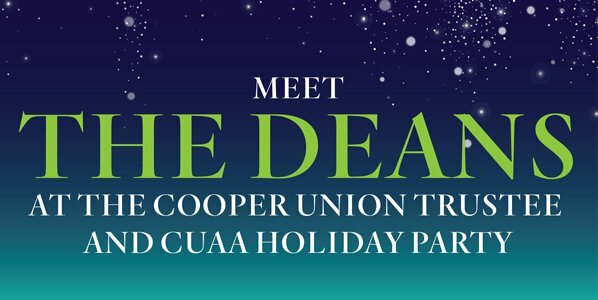 The CUAA, Cooper Union Board of Trustees, and President Laura Sparks invite you to join us for a holiday party! Laura Sparks will lead a conversation with the Deans of The Cooper Union and will welcome Barry Shoop, the new Dean of The Albert Nerken School of Engineering. Alumni, family, friends, students, faculty, and staff are invited. Please join us for a few bites and grab a drink to celebrate the holiday season! To RSVP contact Crystal Ortiz at cortiz@cooper.edu or 212.353.4269.